The way of singing of the Valborg Choir is based upon the experiences of the Swedish soprano Valborg Werbeck Svärdström (1879-1972). Mrs. Werbeck Svärdström developed a spiritual scientific view of vocal schooling in collaboration with Rudolf Steiner. Thus the first anthroposophical school of singing was founded, the ‘School for Uncovering the Voice’. Her approach includes a search for the spiritual origin of singing. Valborg Werbeck Svärdström developed vocal exercises to regain the voice and keep it healthy. These exercises focus on the qualitative characteristics of the tone and the breathing of the singers. The basic principle of her approach to the use of the human voice is that the whole voice is already present in the human body. The singing exercises are designed to help to free the voice from any hindrances, thus ‘uncovering’ the human voice. Thanks to the work of Jürgen Schriefer, among others, many vocal artists and singing therapists work out of the principles of the ‘School for Uncovering the Voice’ throughout the world today (Brazil, Croatia, Finland, Germany, the Netherlands, Sweden, Switzerland, United States and United Kingdom). 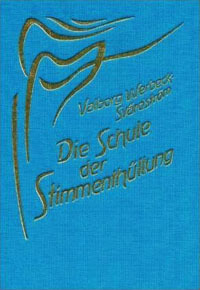 In the 1930’s Valborg Werbeck Svärdström wrote about her experiences in the book: ‘Die Schule der Stimmenthüllung’, Verlag am Goetheanum, Dornach. (ISBN 3723501435 – see picture above).